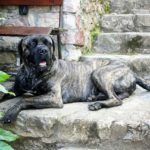 While the accurate name of this breed is the Old English Mastiff or the English Mastiff, the breed is often just referred to as a Mastiff. 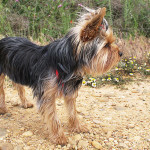 The breed is also known as the Mastie or the Mestyf. 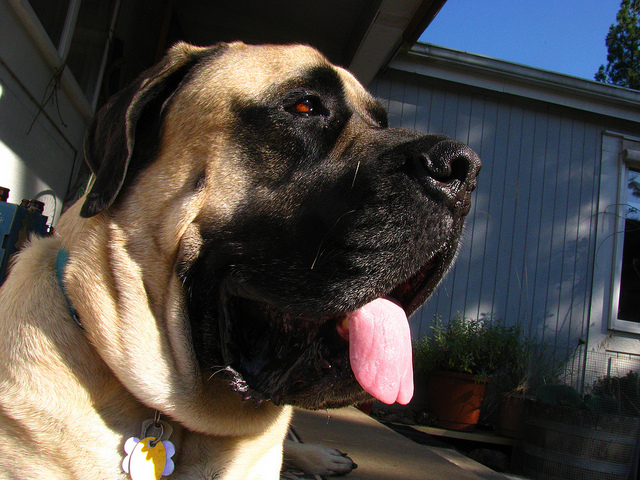 Mastiffs are giant dogs known for their good nature and grandeur. 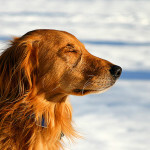 They were originally bred to be watch and guard dogs, yet they are known for their docile disposition with their owners. Mastiffs don’t like intruders and they often act aloof towards strangers. 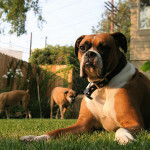 Despite their large size and ferocious appearance, these dogs are often great pets for families. While all Mastiffs supposedly come from Asia, the English Mastiffs were originally bred in England to be guard and watch dogs. 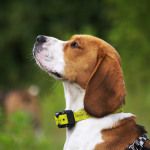 Poor framers and peasants often used these dogs to control savage predators and to ensure their livestock were protected. The Mastiff was also trusted to guard the family and home, and eventually, they became companions to their families as well. English nobility also valued the Mastiff for its loyalty, protective nature, and pack hunting skills. Although it’s difficult to find reliable records of Mastiff ancestry before the 1800s, ancient Egyptian drawings have been found of Mastiffs that date all the way back to 3000 B.C. 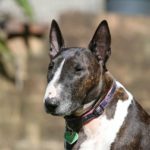 Early Chinese references to these dogs date back to 1121 B.C. It’s obvious that today’s Mastiffs come from very long, ancient lines. In accounts of Julius Caesar’s invasion of Britain, Mastiffs are described as valiant war dogs that fought bravely beside the British. 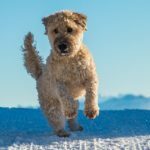 Stories later surfaced about these dogs being brought to Rome, where they were sent to the Colosseum to fight against human gladiators, bears, tigers, bulls, and lions. Another well-known Mastiff story is about Sir Peers Legh, who was the Knight of Lume Hall. When he fought the Battle of Agincourt in France, he brought a Mastiff with him. He fell during the battle and his Mastiff stood over him to defend him. While he later died from his wounds, the Mastiff was returned to the kennels at Lyme Hall. She would become the foundation for the Old English Mastiffs from Lyme Hall, from which today’s modern Mastiff descends. About 600 years ago, this breed was used for hunting. They would use Mastiffs in packs to hunt deer, lion, and other types of large game. Although animal-baiting and dog-fighting became illegal in England in 1835, these sports continued for many years. After pit-fights were forbidden, the breed’s numbers began to dwindle, and by 1945, there were only 8 Mastiffs of breeding age to be found across Great Britain. In 1879, the American Mastiff Club was founded, although it disbanded shortly thereafter. In 1929, the club was re-established. 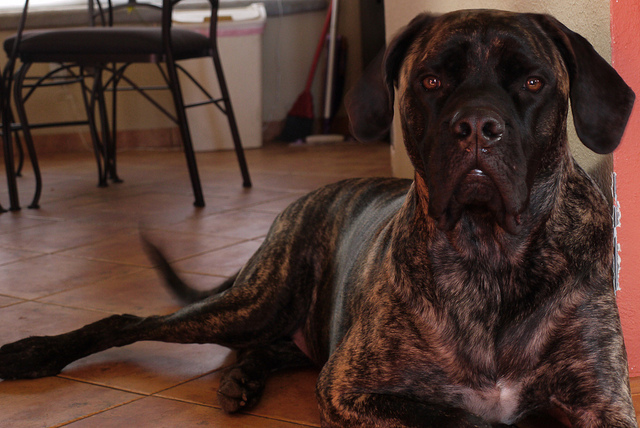 It wasn’t until 1885 that the Mastiff was reocgnized by the American Kennel Club as a part of the Working Group. The Mastiff is heavy and large, and these muscular dogs have a short muzzle and a heavy, square head. They have a black mask around the nose and eyes, and their ears are fairly dark as well. 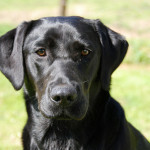 They have dark, medium sized, wide set eyes that have an alert, kind expression. 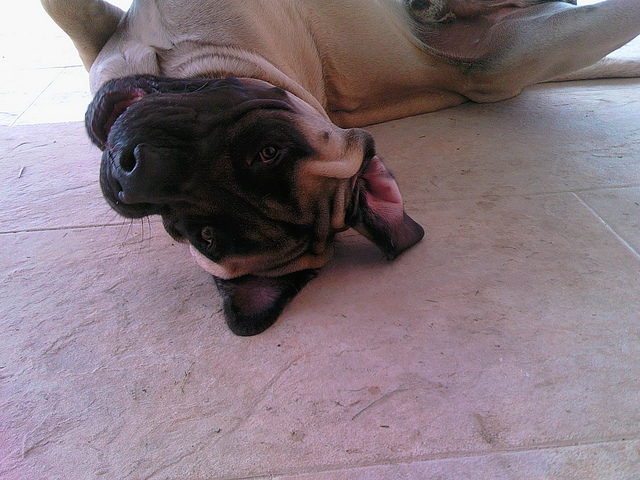 Mastiffs have small, V-shaped, rounded ears and a tail that is set high, tapering at the tip. The outer coat of the Mastiff is straight and short, and they also have a dense, short undercoat. 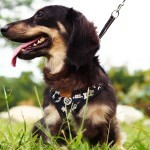 The coat generally comes in apricot, brindle, or fawn. 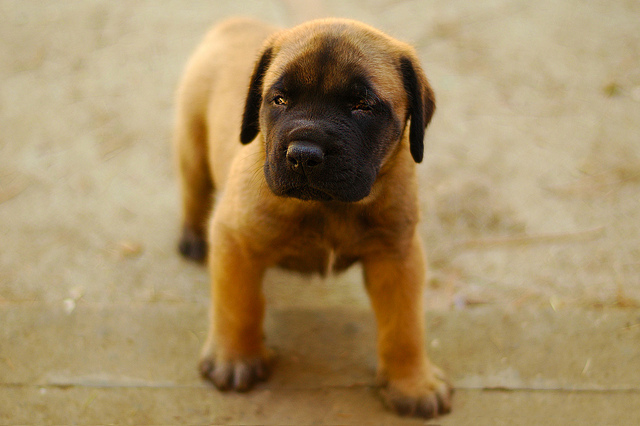 Mastiffs with brindle coloring usually have an apricot or fawn background with dark stripes. 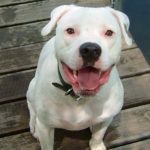 In some cases, these dogs may have a little patch of white on their chest as well. Around the head and neck, the skin hangs loosely so it appears like wrinkles. Male Mastiffs generally stand at least 30 inches high at the shoulder, while females should be at least 27.5 inches high at the shoulder. Males usually weight between 160 to 230 pounds and females generally weight between 140 to 190 pounds. 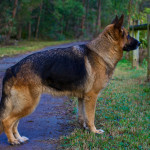 This breed has a rectangular proportion and their body should be longer than they are tall. While Mastiffs were originally bred to be guard and combat dogs, today they are wonderful companion animals that still have the instinct to protect their owners. 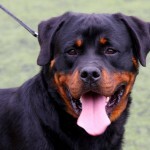 They are wonderful with children and they become deeply attached to their owners. While they are not generally aggressive, they are excellent guard dogs, protecting the people they love and their homes with vigilance. It’s important to begin training a Mastiff as quickly as possible, since training can be challenging. 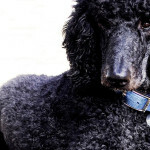 The larger the dog gets, the more difficult it will become to get rid of bad habits. It’s important that Mastiffs are trained by a strong leader that is always consistent. It’s also important to socialize these dogs early to ensure their natural protectiveness doesn’t get out of hand. 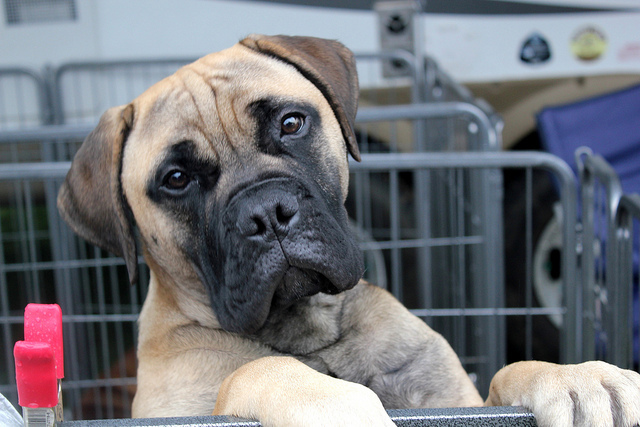 Quality training and early socialization are the most important factors in determining your Mastiff’s temperament. Although the Mastiff has short hair, they do shed year-round, and shedding is especially heavy in the fall and spring. It’s important to use a hound mitt weekly to brush these dogs, which will help control flyaway hair. These dogs only need to be bathed when needed, but their wrinkles should be cleansed each day to prevent infections from occurring. After cleaning the wrinkles, they need to be thoroughly dried. After meals, the hanging part of the upper lip also should be cleaned. A Mastiff’s ears should be checked regularly for infection, wax building up or irritation. Use a cleanser and a cotton ball to clean out the ears. Never use a cotton swab to clean the ears. A Mastiff should have his teeth brushed each week to prevent bad breath and tartar buildup while promoting healthy gums. 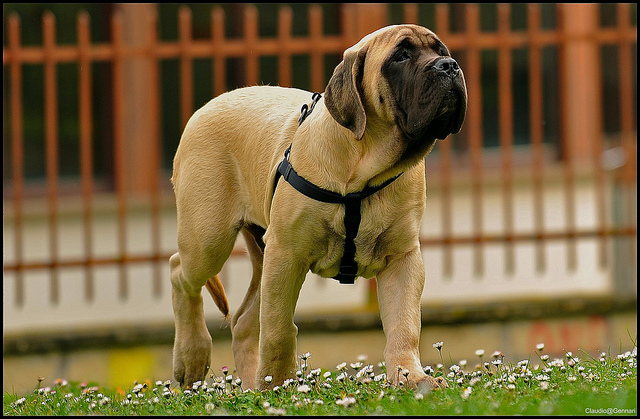 Mastiffs were originally used as war dogs and guard dogs, and they were often used to guard estates or businesses. Some owners continue to use these dogs as guard dogs today. Many Mastiffs have also appeared in film and television. 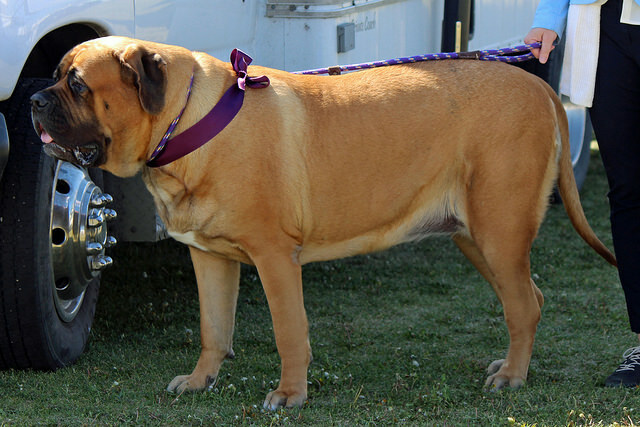 Mastiffs have appeared in movies like Transformers, The Sandlot, Marmaduke, Hotel for Dogs, and She’s Out of My League. One famous Mastiff named Spike was used in a McDonalds’ commercial.